The "Approaching Winds" blows near, as Naruto and Sakura part ways in their training with the Legendary Sannins Jiraiya and Tsunade. The hope it's enough to bring their lost friend Sasuke back from Orochimaru. Only the wind knows where it will take all of our favorite character's to and what adventures will come. The newest booster for the Naruto CCG will be the first set to introduce your favorite characters all grown up. It's been about 3 years since all of them have parted ways and a lot has changed, but their mission have stayed the same - Save Sasuke! 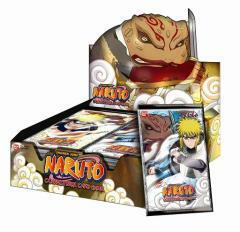 Now you have the chance to experience their power in the ALL NEW Naruto Shippuden cards with this 100 Card Set.